David St John Thomas, the founder and majority shareholder of David & Charles Publishers (now known as F&W Media International Limited), has died. 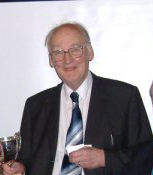 St John Thomas passed away on Monday 18th August shortly before his 85th birthday. He formed David & Charles, which published a range of books for hobbyists and enthusiasts, in 1960 with Charles Hadfield in Newton Abbot, Devon. In the 1970s, the company bought the Readers’ Union, a group of book clubs catering to enthusiasts of needlecraft, handicrafts, gardening, equestrian pursuits and photography, and established David & Charles Inc in Vermont. At its height, the combined operations employed over 300 people. St John Thomas wrote over 30 books himself, including many titles about railways. In the late 1980s, the business was sold to Reader’s Digest, but Thomas kept the Writers News division, which he continued to run for many years. He is survived by his wife Sheila, daughter Alyss, son Gareth and his grandchildren Nathan and Joshua. There will be a family funeral in Scotland and then later a memorial service in Bath Abbey to which all his friends and associates will be invited. Details of David’s funeral and memorial service have been released for the SDRA Membership. They can be found here. The SDRA and SDRT have passed on their sincere condolences to Sheila and the family.